Daniel Doran has left a 5 star review after completing a few courses at YTA. 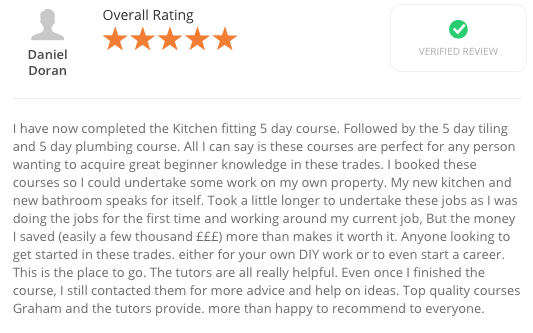 This year he has completed the 5 day kitchen fitting course, 5 day intensive tiling course and 5 day intensive plumbing course. What is also lovely to hear is he has gone on to complete these jobs in is home saving him a few thousand pounds. I have now completed the Kitchen fitting 5 day course. Followed by the 5 day tiling and 5 day plumbing course. All I can say is these courses are perfect for any person wanting to acquire great beginner knowledge in these trades. I booked these courses so I could undertake some work on my own property. My new kitchen and new bathroom speaks for itself. Took a little longer to undertake these jobs as I was doing the jobs for the first time and working around my current job, But the money I saved (easily a few thousand £££) more than makes it worth it. Anyone looking to get started in these trades. either for your own DIY work or to even start a career. This is the place to go. The tutors are all really helpful. Even once I finished the course, I still contacted them for more advice and help on ideas. Top quality courses Graham and the tutors provide. more than happy to recommend to everyone. Jeff Farrow completed our 5 day intensive plumbing course and since completing he has already started work and already sent out his first invoice! He goes on to say he will be returning to YTA Training and Assessment for further training in the new year. We look forward to welcoming you back. Finally decided to get some basic plumbing training after an enforced career change following redundancy in computing. Course was excellent, providing the basics needed to start work as a plumber. Plenty of practical work mixed with some theory and lots of good advice. I have just sent out my first invoice. I plan to do some further training in the new year and will definitely be visiting YTA to do them. If you are considering learning a trade or adding to your existing skills then YTA offer a range of construction courses all taught by experienced ex-tradesmen in a friendly professional environment with small class sizes. To book a course you can either book online or call the centre on 01274682199. YTA is situated in Bradford, West Yorkshire.